What is your view of Worship…? Is worship what just happens in church? Do we identify it with an emotional experience, spiritual thoughts or maybe performing certain rituals? The fact is, true worship is not confined to a place, a feeling or a ritual. God set the standard for worship in His Word, and the standard is much higher and more rewarding than most of us can ever imagine. So, to really answer the question, what does it mean to truly worship God, the only place to turn to is the Bible! Years ago, when billionaire Howard Hughes died, his public relations director asked the casinos in Las Vegas, where Hughes owned multiple casinos to show him respect by giving him a minute silence. For an uncomfortable sixty seconds the casinos fell eerily silent and the manager looked at his watch, leaned forward and whispered, “Okay, roll the dice. He’s had his minute!” Do we treat God as those gamblers in Las Vegas treated their boss? Do we just interrupt our busy schedules once a week, rush to church and give God “His hour?” And, then forget Him and what He has done for us….? But unlike the example of Howard Hughes, our God created us for the ultimate priority of worshiping Him! You see the chief end of man is to glorify God and enjoy Him forever! 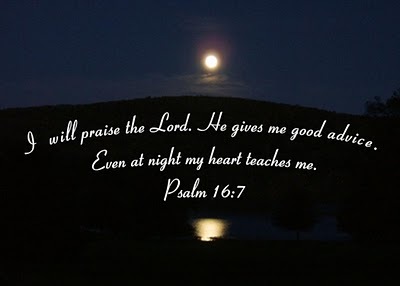 It’s no accident that the longest book in the Bible … Psalms, is all about praising and worshipping God. When we get to the end of the Bible, we see the saints and angels in heaven falling on their faces and worshipping God (Revelation 4:10-11; 5:8-14; 7:9-11). Since worship will be our ceaseless activity and greatest joy in heaven we ought to be practicing it now! The Bible tells us that before creation there was perfect harmony in heaven…. 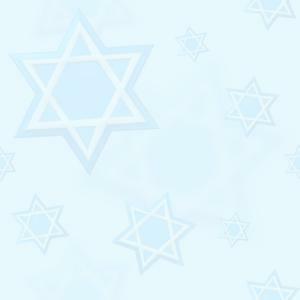 Angels existed in heaven with God (although the Bible does not give us indication of how long they existed with God). All the angels sang in unison together in heaven before Lucifer’s rebellion occurred. Job 38:7 describes; “When the morning stars sang together and all the sons of God shouted for joy?” Music began with its focus on God, the creator of the first creatures who existed in heaven. The “harp” and “organ” is first mentioned in the Bible in Genesis 4:21 and “singing” is first mentioned in Genesis 31:27. 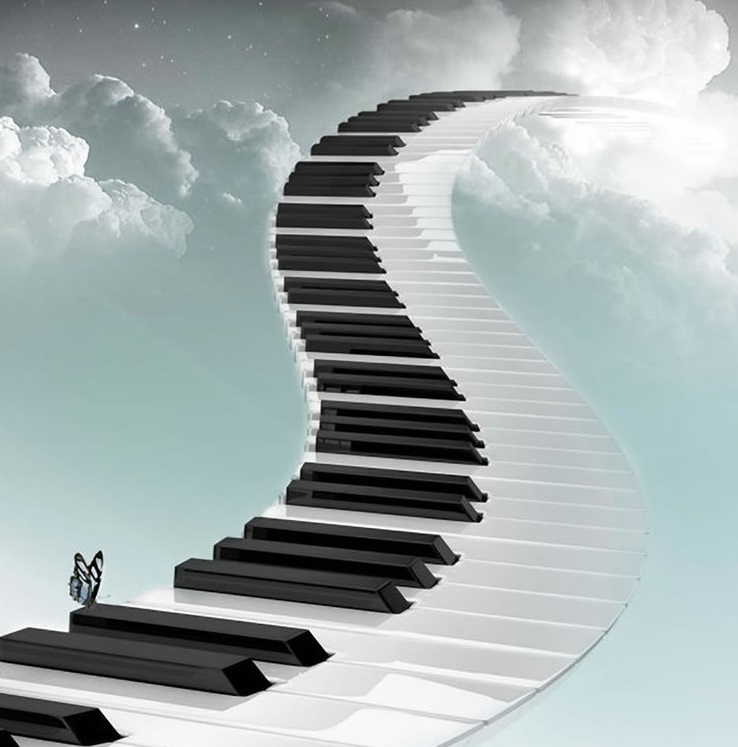 Music could lift up the soul with the finer points of one’s heart to be expressed. Qualities like compassion, real love, lyrics of human struggles can inspire. Musical arrangements in worship were not made to gain God’s attention but were heartfelt expressions to the Lord. The first mention in the Bible of man singing vocally is a praise song to the Lord for His deliverance. Exodus 15:1; “Then Moses and the children of Israel sang this song to the LORD, and spoke, saying: ‘I will sing to the LORD, for He has triumphed gloriously! The horse and its rider he has thrown into the sea!’” The lyre was an instrument commonly used to accompany the human voice. As far back as Job, we have music mentioned (Job 21:12). They take the timbrel (tambourine) and harp, and rejoice at the sound of the organ. A look at both the original word “worship” and the origin of the word in English will help us understand how important “worshiping” is. The primary Hebrew word for “worship” is “Shachah” or “Hishtachavah” (to worship God Eternally – Exodus 4:31; 24:21) meaning; “to depress, prostrate oneself in homage to royalty or God, bow (self) down, crouch, fall down (flat), humbly beseech, do (make) reverence - respect – honour – adoration – honour – submission, make to stoop, worship. There are three Greek words; 1. Proskuneo; meaning to kiss the masters hand, to fawn or crouch, homage, adore, worship. It occurs 59 times in the New Testament and originally carried with it the idea of subjects falling down to kiss the ground before a king or kiss their feet. 2. Sebomai; Meaning to reverence or hold in awe. It is used 10 times in the New Testament. Latreuo; meaning to render religious service of homage and is used 21 times in the New Testament. The word in the English language literally means “to scribe worth to something.” True worship begins with a deep respect or reverence for God, and with a frame of heart and attitude of love, gratitude and appreciation. The fact that God “seeks “true worshippers, implies that there are “false worshippers!” False worshippers either worship something other than God or they may attempt to worship the “true” God, but do it in ways that actually dishonour Him. But, either way, sincerity is not the only criteria for measuring “true worship.” All “true worshippers” are sincere but all sincere worshippers are not true. For example, there are devout sincere worshippers of Allah or Krishna or Buddha or the Mormon god or the Jehovah Witnesses god …but, they are sincerely wrong, because they are not worshipping the only living and true God, who has revealed Himself in the Bible. There are also Christians that are sincere but their worship is man-centred. Sometimes its patterned more after entertainment world than after the Bible. It draws attention to the performers but not to the Lord! Some suggestions of how to grow as a “true worshipper” of the Father: make sure that you truly believe in Yeshua (Jesus) as your Lord and Saviour. Establish daily time with God in His Word; eliminate everything that hinders your growth in worshipping God; prepare your heart and put away distractions; spend time to worship God in His creation. 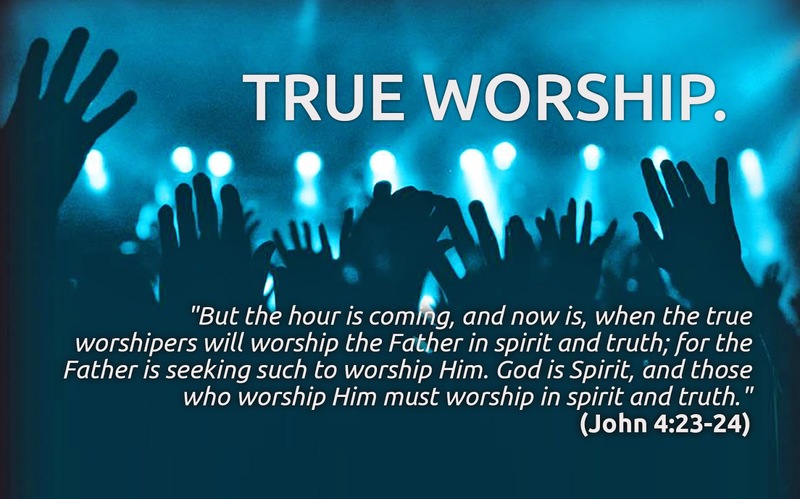 What is the difference between - “Worship” and “Prophetic Worship” …? Of course, everything that we do in life should be an act of worship to the Lord. Worship is not really rooted in what we do, but in who we are. As believers in Yeshua (Jesus) we are worshippers! We worship God because of Who He is and what He has done. The Father is looking for those who will worship Him “in spirit and in truth.” That occurs as we realize who we are - we are His priests. The priestly life is one of devotion, consecration and heart commitment to the Lord through a life of worship. Everything we do should flow out of who we are …and as we realize who we are we will be and do all that God has called us to do living a life of “worship” in a natural flow of reverence before Him. Shortly before getting crowned as the very first king of Israel, Saul personally experienced the power of prophetic worship. After anointing Saul’s head with oil, the prophet Samuel told him: "…You will meet a band of prophets coming down from the altar on the hill. They will be playing a harp, a tambourine, a flute, and a lyre, and they will be prophesying. At that time the Spirit of the Lord will come upon you with power, and you will prophesy with them. You will be changed into a different person," 1 Samuel 10:5-6. Prophecy and worship, when mixed together, set off a supernatural reaction that is both gloriously contagious and transformational. 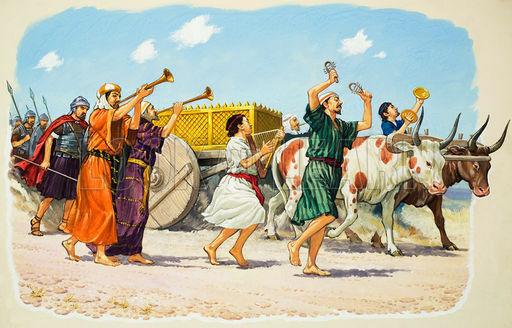 For thousands of years God’s people have worshipped “prophetically.” In Exodus 15:20-21 we read that Miriam the prophetess grabbed a tambourine (timbrel) and launched into a spontaneous song of victory after God parted the Red Sea and delivered the people of Israel from Egyptian captivity. In 1 Chronicles 5:3 the sons of Asaph, Heman and Jeduthun were appointed to “prophesy with harps, stringed instruments, and cymbals.” Elisha called for a harpist, and while the harpist played, the power of God came upon him and he prophesied (2 Kings 3:15). The Psalms are also filled with examples of Prophetic Worship…. and is mentioned in the context of “Davidic worship” which is referring to the Psalmist and is patterned after the life of King David or David, the Shepard boy. David began his life in consecration to the Lord worshipping out in the field with the audience of One. The Lord was his passion and he expressed that passion to the Lord through instrument and song, lifting his voice to the One who is the source of all things. With the anointing of David as King of Israel, a new era was born. David was a man after God's own heart (1 Samuel 13:14) who set forth principles, guidelines and patterns of “Worship” according to the directions he received from the Lord. David rescued the Ark of the Covenant, (which was the symbol of Yahweh's omnipresence; His footstool (1 Chronicles 28:2) from captivity (2 Samuel 5-6), and brought it to Jerusalem. The return of the Ark resulted in great rejoicing. There was food, singing, instruments playing, sacrifices to God (2 Samuel 6:1-19) and dancing. David danced with all his might before the Lord (2 Samuel 6:14-15). He was so free in his dance that he embarrassed his wife (2 Samuel 6:16). He did not care! Why…? Because he was going to worship his God with abandonment. A precedent was established. The house of God was to be a place of worship without boundaries. The Ark was placed in a tent (tabernacle) and David appointed skilled musicians and leaders to worship around the Ark day and night. Before David’s reign, Mosaic worship consisted primarily of animal sacrifices, prayers, intercession and symbolic actions; and the High priest alone approached the Ark (Deuteronomy 10:8; 1 Chronicles 13:8-10). There was no development of the arts in direct relationship to worship practices (except for the craftsmanship used to construct the Tabernacle and furnishings). 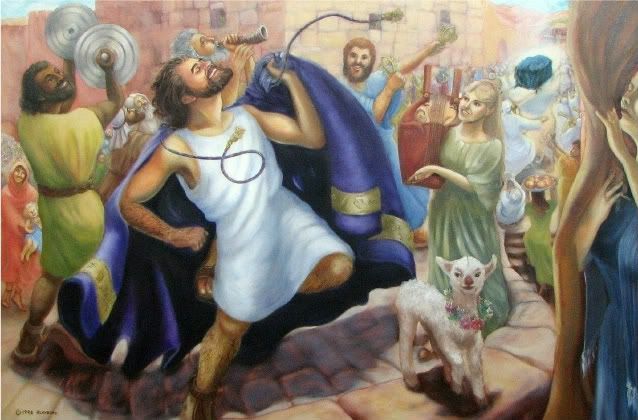 The praise and worship practices of David's time included numerous musical instruments, singing, chanting, shouting, bowing, standing, lifting of hands, clapping of hands, processions and dancing… There were times of great joy, as well as moments of repentance. Davidic worship was often prophetic (1 Chronicles 25:1; Psalms 46:10, 50:7, 85:8), and the singing of new songs (spontaneous songs given by inspiration of the Holy Spirit) was encouraged (Psalms 33:3, 96:1, 149:1). 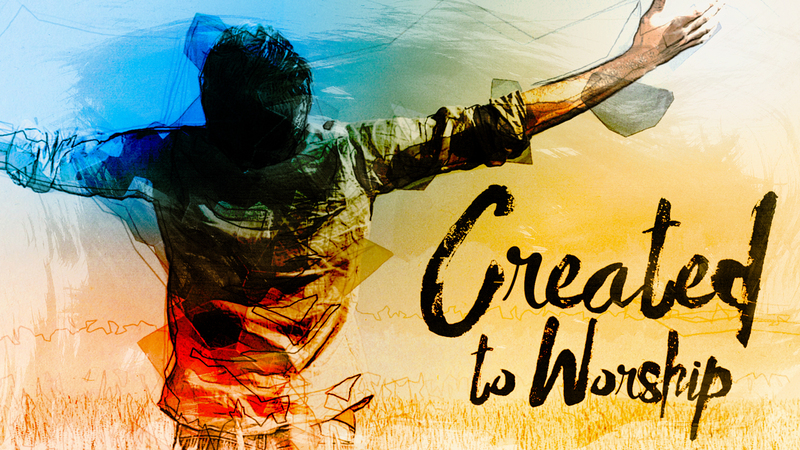 Corporate worship within the tabernacle focused not only on joyfully lifting up the name of Yahweh (Psalm 34:3; 57:5), giving thanks (Psalm 30:4; 35:18), repentance and recommitment (Psalm 26:2; 139:23) …but also on inviting the manifest presence of the “Most High” (1 Kings 8:11; Chronicles 5:14; Psalms 50:2). King David had an experience with the Lord... God had rescued him and refreshed him. David had experienced the presence of God. He was changed. And, he couldn't be silent about it. He sung praise to God; “…He put a new song in my mouth, a hymn of praise to our God,” Psalm 40:3. There was a freshness and newness to his experience with God. It was as though he were seeing God again for the first time. David was expressing a song of gratitude to God for who He is, what He said, and what He was doing. For David knew that the source of his good fortune was none other than God Himself! David was received by Israel's women singing after his victory over Goliath.1 Samuel 18:6; “Now it had happened as they were coming home, when David was returning from the slaughter of the Philistine, that the women had come out of all the cities of Israel, singing and dancing, to meet King Saul, with tambourines, with joy, and with musical instruments.” David was not just a great warrior but a skilled musician and singer (2 Chronicles 7:6). Interesting Biblical facts… In 1 Chronicles: 24-25, that the 24 priests were musicians. King David’s trained choir numbered 288. It continued under Solomon (2 Chronicles 5:12-13; 9:11), and other kings; Jehoshaphat (2 Chronicles 20:21-22); Joash (2 Chronicles 23:13, 18); Hezekiah (2 Chronicles 29:27-30); Josiah (2 Chronicles 35:15,25) and after him Ezra; (Ezra 2:41; 3:11; 7:24) and Nehemiah (Nehemiah 7:44; 10:28). 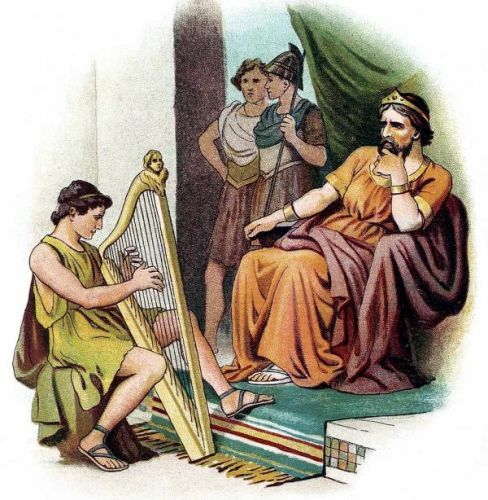 In 1 Samuel 10:5 - David skilled playing upon the lyre (harp) affected Saul’s anger when he was demonized; “And it came to pass, when the evil spirit from God was upon Saul, that David took a harp, and played with his hand and so Saul was refreshed, and was well, and the evil spirit departed from him!” 1 Samuel 16:23. Instrumental music was also found in Solomon's Temple (1 Chronicles 25). Solomon was a song writer and composed 1,005 songs - 1 Kings 4:32; Ecclesiastes 2:8. We read in 2 Chronicles 30:21, that the children of Israel who were present at Jerusalem kept the Feast of Unleavened Bread seven days with great gladness; and the Levites and the priests praised the LORD day by day, singing to the Lord, accompanied by loud instruments. Singing was used as the assembly would present themselves before the Lord… “Make a joyful shout to the LORD, all you land! Serve the LORD with gladness; come before His presence with singing. Know that the LORD, He is God; it is He who has made us, and not we ourselves; we are His people and the sheep of His pasture,” Psalm 100:1-3. There are songs led by a singer with a singing response from the people found in Psalm 136 and 1 Samuel 18:7. The digging of the well (“Beer”) was celebrated by a song in Numbers 21:17-18. Moses taught Israel some of his last warnings by a song (Deuteronomy 32:1-4). In Nehemiah 12:27, “Now at the dedication of the wall of Jerusalem they sought out the Levites in all their places, to bring them to Jerusalem to celebrate the dedication with gladness, both with thanksgivings and singing, with cymbals and stringed instruments and harps.” And in Amos 6:5, “That chant to the sound of the viol, and invent to themselves instruments of music, like David.” So, with the Davidic worship being the foundation to understand Prophetic Worship, we can move on from there. Prophetic worship can be, of course, with or without instruments and has to do with following the Holy Spirit. So, what then makes Worship - “Prophetic” …? Some people think prophecy is limited to foretelling the future and only those who have the “gift of prophecy” can participate. However, at its core, prophecy is simply seeing people and circumstances as God sees them and then participating with Him through words and actions to encourage His intended outcome in and through them. We read in Revelation 19:10 where it says worship God and that… “the testimony of Yeshua (Jesus) is the spirit of prophecy.” In other words, prophecy at its essence reveals Yeshua HaMasiach - Jesus Christ. The result is people are drawn to the Lord, whether through declaring what is to come (foretelling) or what is (forth telling). In this sense, everyone can prophesy. A simple word of encouragement can be very prophetic by giving courage to someone to pursue God’s purpose (1 Corinthians 14:3). Now that you know you can “prophesy,” you’re probably wondering how you worship prophetically. It’s important to realize that prophetic worship shouldn’t be recognized by a form, style or manner of expression, but rather by God’s unction. The dictionary defines unction as “an act of anointing.” And in this context, it’s God’s supernatural anointing on the worshipper and the impact that occurs when we obey the Holy Spirit’s prompting to cooperate with Him in orchestrating a God-moment in worship. Whether we’re leading or following, our obedience requires faith and courage. The risks may sometimes seem high, but the results defy human explanation and the rewards are eternal. The difference between worship with God’s unction and worship without it is determined by whether or not a worshipper is close enough to God to hear His whispers. Your effectiveness as a “true prophetic worshipper” isn’t reliant on your creative talent or human skill but rather on your willingness to be intimate with the Holy Spirit and yielded to Him. What was worship like during the early church…? Paul told the Corinthian church to “Prophetic Worship” in such a clear way that if an unbeliever entered “…He is convicted by all and is judged by all. The secrets of his heart will be revealed, and as a result he will fall facedown and worship God, proclaiming, 'God is really among you, “1 Corinthians 14:24-25. Yeshua (Jesus) stated, “As for Me, if I am lifted up from the earth I will draw all people to Myself,” John 12:32. While His words predicted His death, it still communicates volumes to us in our worship. When Yeshua is lifted up in praise and worship, lost people are attracted to him. William Booth the founder of the Salvation Army used to say...: “If a church was on fire for God, people for miles would come to watch it burn!” To paraphrase Booth - If believers experience the fire of God's worship then lost people would be drawn to God like a moth to the flames. 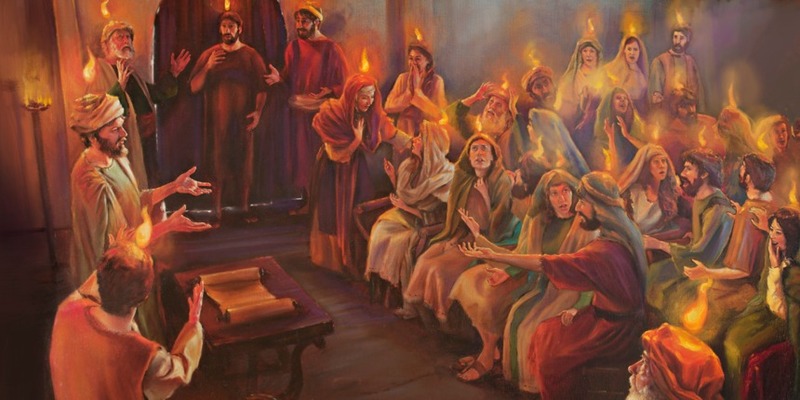 On the day of Pentecost (Acts 2:1-41), it was the sound of eternal worship as the Holy Spirit came upon them in the upper room. Luke described the sound like that of a rushing wind. That awesome and beautiful sound was heard by God-fearing Jews from every nation who thought these early disciples were drunk …but they were “speaking the magnificent acts of God,” Acts 2:11. You could say that those one hundred twenty disciples were singing a new song and the result was that many put their trust in the Lord - three thousand, at least! The disciples worshiped. The people heard and saw it. And, they came to faith in Christ! Let’s turn to Revelation 4:11 and take a look at what the apostle saw in heaven… and what is true concerning the church of Messiah Yeshua (Jesus) here on earth as we reflect upon Isaiah’s vision in Isaiah 6:1-13. In Heaven, in Revelation they cry out “holy, holy is the Lord God Almighty!” On earth, and it will be eminently so in the church, the Bride of Christ, made perfect in the heaven of heavens. And here they adore one God, and one only, the Lord God Almighty, unchangeable and everlasting Father, Son, and the Holy Spirit; and these are one infinitely holy and eternal Being, who sits upon the throne, and lives for ever and ever. In this glory John saw Christ, and spoke of him. He heard the adorations of the four-and-twenty elders (Christians). Here he observed the object of their worship of Him that sat on the throne, the eternal ever-living God. The true church of God has one and the same object of worship. There is but one God, and he alone, as God, is worshipped by the church on earth and in heaven. And, the acts of adoration: (1.) They fell down before him that sat on the throne; they discovered the most profound humility, reverence, and godly fear. (2.) They cast their crowns before the throne; they gave God the glory of the holiness wherewith he had crowned their souls on earth and the honour and happiness with which he crowns them in heaven. They owe all their graces and all their glories to him, and acknowledge that his crown is infinitely more glorious than theirs, and that it is their glory to be glorifying God. Prophetic Worship gives breakthrough because of our hungering for the fresh – a “now word” that God desires to speak to us. He always wants to have fresh communication with His children. It is His desire to continually give us fresh manna. Yeshua (Jesus) is the bread from heaven and we have access to partake of Him continually. The Blood of Yeshua (Jesus) made access once for all and gives us permanent access to the Throne of God to experience Him continually. The problem is never on God’s end! It is our light of understanding that enables us to experience Him regularly. It is a constant dependence on God that graces us to be continually in tune with His heart just like King David and it is about hearing the voice of God, flowing with the wind of the Spirit and speaking what one hears from that place before His Throne.